If you’re anything like me, your hairstyles consist of a few main looks. I tend to favour buns and pony tails, simply because I don’t like to have my hair in my face and I don’t think that I’m skilled enough to do anything more with my wayward hair. Over the years, I have looked at many hairdressing magazines and books, which feature hundreds of different styles and hair designs. Many of these have claimed to be simple-to-do, but unless you have the exact same hair type as the model, or the skillset of a talented hair stylist, it’s unlikely that your locks will look anything like the ones in the picture. Add to this time constraints and an inability to tame frizzy flyaways, and you’ll understand why my hairstyles rarely vary from the same look. But sometimes you just want to look a bit different, whether it be for an event, or because you’re sick of seeing the same thing in the mirror every day. 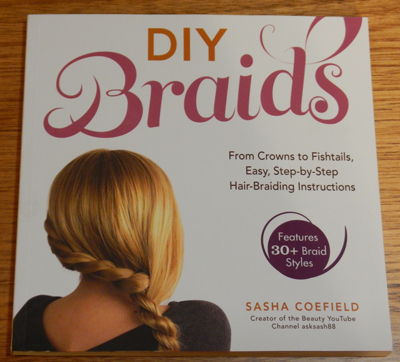 DIY Braids, a book produced by YouTube sensation Sasha Coefield, is the perfect solution to your hairstyling woes. Best known for her YouTube Channel, asksash88, Sasha Coefield has more than 120,000 subscribers, and often posts easy-to-follow hair, makeup and beauty tutorials. Now, having branched out into the publishing world, even more people will be able to adopt her creative hairstyling techniques. This book features over 30 braiding hairstyles, including Fishtail, French, Figure 8, and Four-stranded braids. Chapter one deals with the classic braiding styles (and helps set you up for the more complicated styles further on in the book), while the second chapter features the above styles and more. Each style has a different difficulty level attached (easy, intermediate or hard) so you can choose your style according to your ability, and features step-by-step pictures and instructions for easy hairstyling. This book is perfect for anybody who wants to master braiding techniques or give their hair a different look, and is a worthy addition to the beauty-dedicated bookshelf of your personal library.